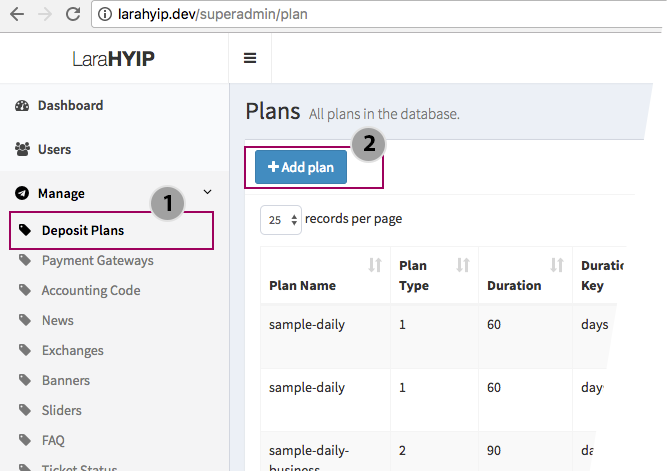 Interestingly in LaraHYIP, you can’t find the typical Plan Settings in Admin, you need the Super Admin Control (Access) to do the Plan Settings. We followed a simple theory of User Experience Design and separated One Time Settings to Super Admin and reduced the admin panel for Day-to-Day Admin Tasks. This gives more clarity in User Interface and as developer makes it easy for us to implement security layers and logging. Set the Status for the Plan. Only the Plans in active state are available for members to deposit. Related Tags : HYIP Plan Settings, HYIP Deposit Plan Settings, How set interest rate in HYIP ?, How to set active plans in HYIP ? How to set Minimum Maximum Deposit amount in HYIP Admin ?, How to set plan duration in HYIP ?, How to set Daily Plan in HYIP ? How to set Weekly Plan in HYIP ?, How to set a Plan for Business Day Only ?, How to set Monthly Plan ?, How to set Yearly Plan ?, How to set Long Term Plan in HYIP?